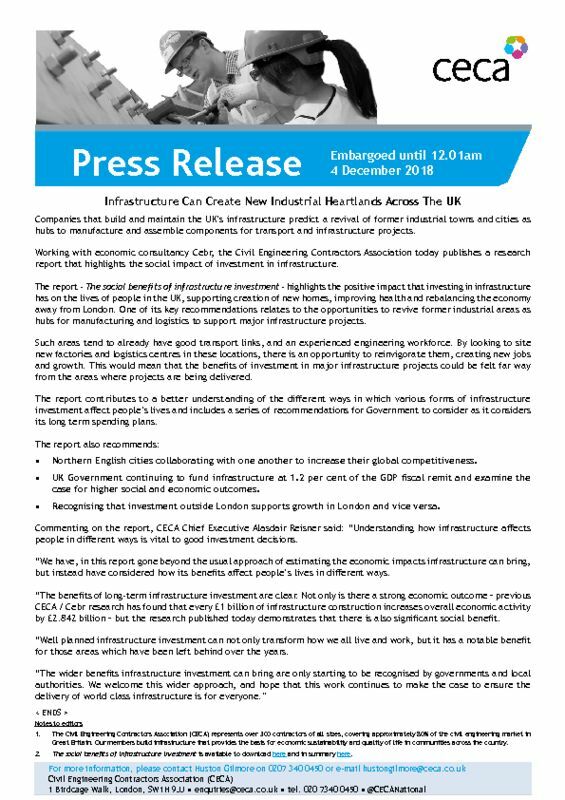 The report – The social benefits of infrastructure investment – highlights the positive impact that investing in infrastructure has on the lives of people in the UK, supporting creation of new homes, improving health and rebalancing the economy away from London. One of its key recommendations relates to the opportunities to revive former industrial areas as hubs for manufacturing and logistics to support major infrastructure projects. Commenting on the report, CECA Chief Executive Alasdair Reisner said: “Understanding how infrastructure affects people in different ways is vital to good investment decisions. “We have, in this report gone beyond the usual approach of estimating the economic impacts infrastructure can bring, but instead have considered how its benefits affect people’s lives in different ways. The social benefits of infrastructure investment is available to download here and in summary here.